Searching for Pigeon Forge Internet Access cabin rentals? Cabins USA offers a listing of cabins with Internet that features rentals to suit every taste and budget. Though many of our cabins have rustic log cabin appearances and are nestled in private mountain settings, it doesn't mean that you have to without the convenience of staying connected with the outside world. We offer rentals with Internet in Pigeon Forge, Sevierville, Wears Valley, and the Tennessee Smoky Mountains. Additionally, many of cabins come with WiFi Internet connections. Having a Smoky Mountain cabin rental with access to the Web means that you can easily keep in touch with friends and family back home. Better yet, you can share pictures and stories on social media of the wonderful sights and attractions you got to experience during your trip! If an emergency were to come up at home or at work, this amenity makes it easy for you to stay in touch and keep on top of your business. While you are in the comfort of you cabin, you could explore our local area attraction guide or our Pigeon Forge events calendar. Though Internet access is surely practical, it can also be downright entertaining. Stream your favorite music, movies, and shows during your cabin vacation. The kids will love sharing funny videos on YouTube and the adults can settle arguments over trivia. 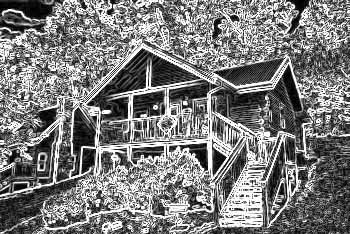 Best of all, you can book one of these Pigeon Forge cabin rentals with Internet and save 15% with our online discount! Experience a terrific stay in the Smokies with all the comforts of home when you reserve the perfect cabin for your Tennessee mountain vacation.